Watch Live @ 7:30 pm EST Tonight: What Might Alien Life Look Like? The cover of David Aguilar's new children's book, "Alien Worlds," which imagines how life might look on various known exoplanets. Our Milky Way galaxy contains billions of planets, many of which may be capable of supporting life. But if aliens are indeed out there, what might they look like? David Aguilar has come up with some ideas, and he's sharing them with the public in a live webcast tonight (Dec. 19), beginning at 7:30 p.m. EST (0030 GMT on Dec. 20). 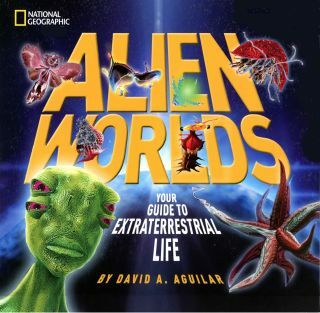 Aguilar, director of science information at the Harvard-Smithsonian Center for Astrophysics (CfA), will discuss "Alien Worlds," his latest National Geographic children's book. "He applies real-world biology to known exoplanets and populates them with exotic life forms that might actually exist," CfA officials wrote in a media advisory about the event, which is part of the center's monthly Observatory Night series.